The fifth interview in our Successful Businesses Interview Series features Dann’s Daily, the only pescetarian cafe in Singapore. Pescetarian (pronounced as pes-ker-tay-rian) refers to a diet with no meat, but with seafood. 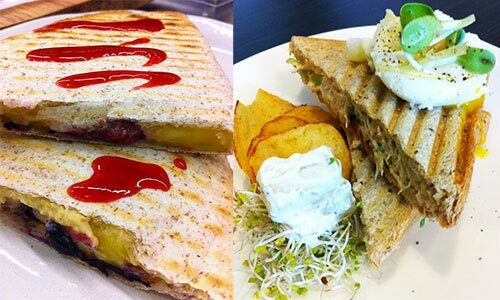 Dann’s Daily prides itself at offering wholesome, healthier meal choices that are tasty at the same time. Like Citrusox, the PR agency for Dann’s Daily contacted me for potential inclusion of Dann’s Daily in the Successful Businesses Interview Series. After checking out their website, I thought they have a wonderful concept and story behind their business, which will be great to share with all of you. I’m glad I did as the owner (Christina) is such a wonderful, amazing lady. More on that later. 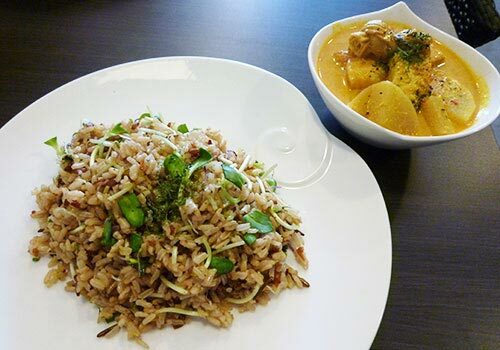 This is one of their set meals – Brown & Wild Rice Salad (steamed organic rice and organic sprouts) and Curry of the day (self-made paste, freshly pound). I’m a curry person and I really enjoyed their curry. It’s light and not too spicy – just the way I like it. You can really taste the freshness of the ingredients. Chris’ signature steamed cupcakes. Left – Banana Oats. Right – Banana Caramel. I had the Banana Oats and it’s great! Nice, light and tasty. 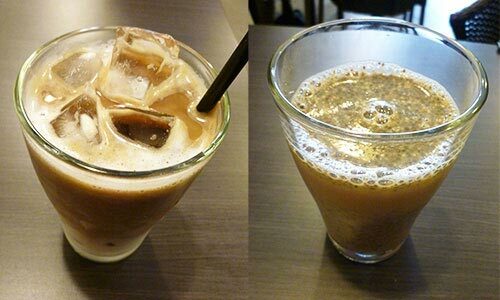 Xing’s concoctions: Left – Teeccino Latte (Caffeine free). Right – Soy Chia Chia – a healthy drink with lots of chia seed goodness. Me and the owners – Christina, 36, and Xing (Christina’s husband) 🙂 Christina is the head chef while Xing concocts all the drinks. The special thing about Dann’s is they create very wholesome meal options – nutritious, fresh, healthy, yet not compromising on the taste at the same time (in fact IMO they taste so much better than supposedly tasty but unhealthy junk food). Their food is created using the freshest ingredients with no MSG or additives. Their staples such as rice, sugar, bread, pasta are organic. Healthier ingredients are used in place of commercial norms, such as grapeseed oil over butter, raw sugar, organic rice, unsweetened soymilk vs. diary, etc. Cooking methods are healthier as well – Steaming is the standard preparation method, vs. frying/baking. Chris was a wonderful host. In the 4-5 hours where we chatted over her wonderful, very tasteful and clean food (The way I like it – since my fasts, I’ve a disdain for food with additives. You can also literally taste the freshness of her dishes and its ingredients while eating), I learned a lot about the story of how the cafe started, challenges faced, how she overcame them and her latest plans for her cafe. She shared with me about her dad, who was a great pillar of strength for her when she was young and whose love for her touched her very deeply. Unfortunately, he passed away when she was 16, due to colon cancer. This struck her because colon cancer is caused by one’s diet, and her dad was a heavy meat eater in his life, especially red meat. This proved to be one of the points where she developed a keen desire to learn about healthier diets. She also shared with me her passion in cooking and baking, which she had developed since young. She had always dreamed of setting up her own food business – initially a muffin shop, then later evolving into a food cafe since it would give her the leeway to experiment with greater variety of dishes. Before setting up Dann’s, she has long been pursuing this passion on the side. She would cook, bake, experiment and whip up new recipes during her off-times, then bring her creations for her colleagues to try. Finally in 2010, her long-held childhood dream came to life. She launched Dann’s Daily on 10 Sep ’10, together with her husband, Xing, who is the owner as well, and named it after their son Dann (he’s 7 this year). In the short 8 months since they’ve been around, they’ve been covered in various magazines, newspapers, and online blogs – and they they recently got covered by an episode on a TV segment which will be out in Sep this year. I adore the wholesome living message at Dann’s Daily and I love that Chris is spreading this message via her lovely, quaint cafe, and making it ever easier for others to practice healthier living. I even love how she brings it to life through her own creations – proving to others that it’s possible to have healthy and tasty meals without the use of additives, unhealthy ingredients and conventional commercial cooking methods which may not be the healthiest. Because Chris places such dedication in her cooking and she makes a point to create brand new, differentiated dishes from whatever’s out there (think tofu pumpkin curry, brown rice nasi lemak, steamed cupcakes), I truly consider eating her food to be like having gourmet cuisine at the price of regular food. A definite steal if you ask me. Q1) Tell us more about you Chris – Who are you and what are your passions in life? Hi, I’m Chris and I’m the founder and owner of 2 businesses – a PR agency and a cafe, which is Dann’s Daily. Both represent my passion, which is creativity. I like to immerse myself in a creative environment and to keep in touch with creativity. With my agency, I get to express my creativity as a messenger, where I convey the message for my clients to the media. With my cafe, I get to convey the message of my own brand, my own voice and also make my own creations. It also allows me to express my other passion that is cooking and preparing food. Q2) What is your business about and what does it do? Dann’s Daily is a pescetarian cafe. We offer a more wholesome choice and balanced diet. We understand customers want healthy food but still indulge in food like curry, toast, desserts, so we make these food available to them in a wholesome manner, by ensuring high quality of the ingredients and the freshness. So they can enjoy a wholesome meal that’s nutritious as well. Q3) Who do you target, and what do you do for your customers? We reach out to anyone who appreciates the value of good, simple, nutritious, food. Our customers are from everywhere, from kids, teenagers, adults, elderly. We price them to be affordable for everyone, though our customers tend not to be price sensitive as they understand the importance of nutritious food. Whether you are a working executive, or just a homemaker, or a student – as long as you’re open to make a change in your lifestyle and a change in your habits, you are welcome to step in. Q5) When did you first start your business? We started on 10 Sep ’10. Q6) How did you first come up with the idea for your business? I’ve always had a passion in cooking since young. It’s always been a dream have a shop of my own, where I get to showcase this passion. However, I didn’t do it in my earlier years as I thought such things need money, and I needed time to save up. In my mind, this was something I’d pursue when I had enough money and the time was right. So while I was working in the weekdays (while I was still an employee), during the off-days such as weekends, I’d make my own creations, such as pineapple tarts, cookies, cakes, muffins, and more. I’d bring them to office for my colleagues to try the next day. They liked them so much that they’d even pay me money to make the tarts, such as during Chinese New Year! This was something I did on an ongoing basis. I’ve also been passionate about overall health and wellness for a while. As a kid, I was very fat, up until I was secondary 1. A that time, I was 166cm and 58kg. In my first week of school, I had to wear my primary school uniform (instead of my secondary school’s) because the school did not have available sizes for me! I was laughed at by my school mates. It made me really feel hurt, and as a result I became more conscious of my weight. That year, I started to lose weight through increased activity and a healthier diet. When I was 16, while I was in sec 4, my dad passed away due to colon cancer. It struck me and got me thinking, because colon cancer is caused by the type of food you eat. My dad used to eat a lot of red meat such as beef. He had poor digestion and would suffer from constipation. This made me further conscious of the importance of healthy eating. Over time, I educated myself more on healthy eating. At the same time, I ate more healthily too. I slowly cut meat (chicken, pork, beef) out of my diet, and gradually adopted a pescetarian diet, together with my husband, Xing (who used to be a heavy meat eater himself and was quite heavy – he subsequently lost weight when he switched to a healthier diet). We wish to share with people that the long-lasting benefits of living well and eating well starts from young. Around this time, my desire to have a food business grew stronger. I decided it was about time we put this into action. So last year, I told my husband, Xing, to start looking for spaces to rent, in preparation for our food cafe. Q7) After you came up with the idea, how did you get started? Please walk us through what the first few months of your journey were like. One day in July ’10, Xing chanced upon this place that was up for rent. We found the rental was affordable (about $4-5k SGD/$3-4k USD per month) – it’s hard to match this price for retail spaces. So we met the agent, looked at the space, and decided to get it – all within a week! At the time we confirmed the shop space, we did not know what concept we wanted to have nor that it was going to be pescetarian. We just knew we wanted a food cafe and it would be called Dann’s Daily. It was when we signed on the dotted line that it hit me that we had to come up with the cafe concept and menu items, and we were on a timeline to launch the cafe and open for business. We decided to make it a pescetarian cafe, since our family is on a pescetarian diet. Everything happened very fast after that. We got a few contractors to quote on costing. The renovations took place in August. We came up with our menu. And on 10th Sept ’10, we were open for business. The first few months were really tiring, physically and emotionally. I had to run the new cafe, manage my other business and find time for my son. At home, my son would cry and ask for attention. At my other business, we lost a few clients as some clients insisted on dealing directly with me but I couldn’t be around to work with them. I had no off days, not even weekends. At the cafe, we open at 9am, we close at 9pm (now 10pm). Every morning, I had to wake up early to go to the market to buy fresh ingredients. At the cafe, I had to run the cafe, prepare food and serve the customers. When I return home, I would just sleep through the night and had difficulties getting up in the morning. At one point, I even asked Xing – Did we do the wrong thing? Should we sell this concept to other people? Should we just give up? But no sooner after I asked these questions did I pick myself up and quickly changed my thinking from negative to positive. I addressed the challenges. (Celes: More on these in Q12) The first few months was a lot of fine tuning as it was my first time running a retail business. Things started settling in at the fourth month. I found that as I got more positive, good things started to happen. Results at Dann’s Daily got better. We closed new clients for my other business. Things got back on track. (Celes: The story of how Dann’s started is different from how most businesses start. Basically as Chris shared above, it was a spontaneous decision, made after they saw the space up for rent. From there, everything fell into place, one after another. Or rather, because Chris and Xing took action there and then, they allowed the wheels of fate to shift into motion, and promptly sped ahead for the ride. Q8) How did you get your first customers? When we first opened, we did not pitch to the media right away as we were not ready. We wouldn’t know how to handle if the response was too big. Hence, our first customers were walk-ins. People willing to try new things. These were mainly foreigners – expats, Caucasians, Japanese – who then became our loyal customers. In Oct (1 month after the cafe started), we pitched to the media. The reception was very good, because of several reasons: (1) Unique concept (2) It’s a new brand on the map (3) Unique cooking methods. 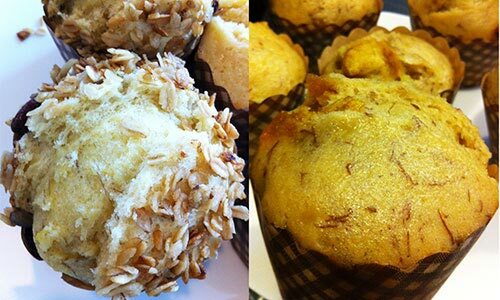 For example, steamed vs. baked cupcakes. Use of alkaline water to wash the rice. We got quite a number of exposures on print and online. After the media coverages, we got quite a lot of walk-ins. Some customers have never heard of steamed cupcakes. Some saw our signature drinks like Teeccino and got curious to try. For the customers who tried the food, they found it to be unique, high quality (can taste the freshness of the food) and with a reasonable price. This led them to tell their friends about it. Q9) How long did it take (after starting) before you experienced the first signs of success? What were those signs of success? About the first month. Though we just started then, I observed some customers coming back almost every other day, with our most loyal ones coming every day. After a while, some customers even told us this is like their second home! We had customers telling us the food is great and we cannot shut down our business. There were other signs too, such as positive feedback on the food. A lot of them really enjoy the food. For example, our brown rice. 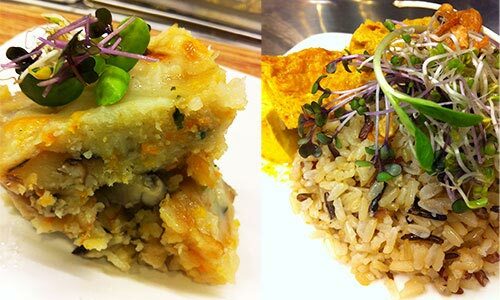 Our customers told us that they usually don’t like to eat brown rice because the texture is either too hard or too wet. However, they feel the texture of our brown rice is just nice and chewy. Another example is the steamed cupcake. Once, there was a very grouchy lady customer who refused to try anything on the menu (she came with her daughter). After I convinced her to try the cupcake, she gave it a go. She was won over and even scrapped every last bit of the cupcake in the paper cup. Moments like this give me a sense of achievement as a chef. Yet another sign was how our customers advocated the cafe to their friends. The ones who came to try the food and like it would often return with their friends. This then created a positive cycle of word of mouth. There was a time (in the cafe) when I overheard one of my customers’ friend (after dining) sincerely telling her: “Hey, thanks for telling me about this cafe”. As a cafe and owner, I felt so good hearing that, because it indicated that we’re doing something right. Q10) At which point did you know with certainty that it had taken off? As we are running a business, at the end of the day it’s about the numbers and making it financially sustainable. I’d say the point it was when we broke even, after 6 months. Q11) What would you say are the biggest drivers of your success today? 1. Word of mouth. We really have to thank our customers today for the cafe’s success to date. (Celes: When talking to Chris, I noticed both Xing and her knew the customers personally – down to their stories and backgrounds. This goes beyond a usual customer-shop owner relationship, and is undoubtedly part of the charm of the cafe. Such an emotional connection cannot be feigned nor replicated. Customers who feel connected to your brand will want to return day-after-day and advocate what you do to everyone else, on their own accord. 2. Media pitching. It helped the mass public to know about our cafe and triggered them to drop by and try. 3. Food quality. Our food speaks for itself. We use only quality, fresh ingredients and our customers can tell the difference. Besides quality, there’s also the creativity, the uniqueness of our dishes. (Celes: All dishes and recipes are invented by Chris herself, so you can’t find them anywhere else. For cupcakes alone, I was looking through her past creations and she has probably created over 40 different flavors to date, including Kiwi, Mango Yoghurt, Pumpkin Coconut, Peanut Butter Banana, Chocolate Strawberry, Blueberry Maple, Durian, and more! Talk about never-ending flow of ideas! While others can copy concepts, they can never replicate a chef’s creativity. Chris also mentioned how she would whip up new items, based on her mood, then bring them to her other business for her colleagues to try. She has been doing this almost every day/week, even before she started Dann’s. This is truly 10,000 hours at work here – when you keep utilizing your skills, you’ll become a master in it in no time. For Chris, coming up with new recipes, cooking, preparing meals are all natural habits in her everyday life now, and virtually effortless. Q12) Looking back, what were the biggest obstacles you faced in your journey to date? How did you overcome them? 1. Overcoming customer pre-set beliefs. At first, it was challenging to get people to take the first step into the cafe. People would stand outside in curiosity but not step in. When they saw the word “pescetarian”, they didn’t know what it meant. Some even thought we were a cafe for pets as the shop beside us sells pets! Then when we stepped out to welcome them, they would quickly walk away. For those who decided to step in and check out the menu, there was the second challenge – getting them to try the food. They would resist and say “I don’t take brown rice or wholemeal”. (Celes: Since Dann’s offers wholesome meal options, it uses brown rice and wholemeal for staples.) Some thought our items were too healthy and hence wouldn’t be tasty. How it was addressed: I learned to turn the situations to my advantage. For the first group, we just let them be as we didn’t want to go the hard sell route. We noticed they would eventually walk in after standing outside and observing it for a while. For the second group, I learned to observe, understand people’s mindsets, then adapt to suit them. For example, for customers who refuse to try an item, I’d suggest them to give it a try. For customers who say they don’t take wholemeal, I’d tell them that it doesn’t taste like wholemeal after toasted, but more like white bread. After tasting it, they’d realize that it’s really true. Initially, it was quite a challenge to work so closely with Xing every day, in the same restaurant, same kitchen, same space. We fought a lot, almost every day. It could be over littlest of things, such as pricing of the dishes or organization of food in the fridge. In the end, we realized this wasn’t sustainable, so we had a good chat after we calmed down. It’s not healthy to quarrel all the time. Not just for the business, but it also spoils our mood, and in turn, quality of food prepared. After talking, we came to a compromise. How it was addressed: We identified clear roles and boundaries for one another. For example, I would have complete ownership over the cooking, while Xing would own the drinks. We agreed not to disrupt each other during our preparation nor question what we were doing in our areas. I also became more organized, such as with my cooking and organization of food in the fridge, so it would be easier for others to find the ingredients. 3. Managing my agency. When I started out the cafe, I had to devote my time here. Hence, I asked my team to handle my older clients at my agency (when I’d normally handle them). This resulted in some difficulties as the clients were used to working with me, and wanted to deal directly with me. Things snowballed from there, and I lost a few clients as a result. It was very challenging for me. Financially, I had lost a huge chunk of revenue, but I still had to sustain the agency. I didn’t want to cut any staff. I was very stressed during that period of time. But I didn’t want to give up. How it was addressed: I took action and sought new clients. I worked weekends and nights, with no break. From there, I closed 2 new clients for my agency, which brought in new revenue streams and stabilized the situation. 4. Time management. It was a challenge to find time for my son, for my family, for myself, for the cafe and for my agency. How it was addressed: Xing and I spoke to Dann to make him understand we were not neglecting him. It took us a few months to make him feel good. We then got him to the cafe during the weekends, where he started making friends with customers at the cafe. It also helped in that it gets him exposure to different people. There was once he sat on the customer’s lap. There are even times when customers asked if they could bring him home! My mom and my younger sister also stepped in to help. My mom took care of Dann’s basic needs such as ferrying him to school, while my sister helped with Dann’s homework. With my PR agency, I worked late at night to take care of the work. I didn’t fall sick during this time but instead became stronger. Most recently, my other sister Justina quit her job to join the cafe full-time, as the manager of the cafe. She will be helping me with the operations and accounting. Q13) What are the biggest lessons you’ve learned in this journey? 1. Cost management. As the chef, I think more about the end product – whether the food tastes good and whether people like it. Hence, I’m blind to the price tag and buy whatever is needed to create the dish. Unfortunately, it has resulted in situations where I sold products for less than cost price! This isn’t good for the business. I learned to be conscious of the costs of the ingredients. Even though I’m running Dann’s because it’s my passion, this is still a business and it needs to be sustainable. I’ve started to take dedicate the buying of ingredients to others so they can note down the price. I’m also learning to price the items more appropriately. We’ll be doing a cost-management exercise soon for each dish to make sure that we’re not selling it at a loss. 2. Time management. I’ve learned to give time to myself, as well as the family, my other business, and my cafe. 3. Staying positive. Always try to think positively. When you keep a positive mind, good things will just happen. Your mind is very powerful. When you think negatively, you’ll attract the negative things to you. I noticed as I got more positive, the results at Dann’s got better. Good things started to happen. For example, with my PR agency, new clients came to us without us looking for them, and these turned out to be nice clients too. Recently, we got a surprise invitation to be featured on a TV program, which will be out in Sep this year. Q14) Let’s say you can start all over again. What are 3 things you would do differently? Plan menu more carefully, in line with the customers’ needs. I was too impulsive and did not plan carefully in terms of menu offering. This led to several menu changes (they’re planning for their third menu change now and it’s been 8 months since launch). The first menu was just offering people things I like to eat, but I did not consider these may not be things others like to eat. I’d find out what customers like to eat and design around that. Understand the population in the location, such as demographics. Since I just jumped on the opportunity because the space was up for rent, I did not take time to understand the background. I did not care about who live there, or the food they like. I only learned this as I went along. It can be quite a painful process to adjust and readjust, so the first few months was quite a struggle. Have a larger kitchen space. After several months of cooking, I’m starting to feel the kitchen is a bit small. Q15) Again, assuming you can start all over again: What are 3 biggest things you’d focus on? Location. I’ll look at the location, to ensure there’s enough human traffic. Constant traffic flow is very important. The location we have now is a bit quiet. There are times when it’s very busy, and times when it’s very quiet. If I could choose, I wouldn’t take up a space like this. Business plan. I will have a proper business plan, with planned budget, ingredients, set-up, expansion plan, PR plan, etc. Whereas for Dann’s, because we started on impulse, there was no proper planning at the start. We booked the space and had to rush to renovate and start the cafe for business thereafter. PR/Marketing plan. I’d play equal attention to PR/Marketing and operations. I feel I have neglected the former as I’ve been too immersed in the latter. Q16) How would you advise someone who is just starting his/her business and wants to bring it to success? Originality. Being original is very important. I find a lot of entrepreneurs like to copy other people’s concepts. Everything out there looks the same today and it’s so boring. I think if you like to be an entrepreneur and a successful one, one of the key values is originality. Really create things that you can call your own creation, that no one has done before. Always inspire yourself. This might include doing certain activities such as exercising. For example, I force myself to wake up early in the morning to go jogging. I know by exercising, my ideas come. Do whatever activities you need to open up your mind for more ideas. Otherwise, your business will become a machine. There’s no excitement, no spice to it. You should go to work every day feeling inspired and excited. Positive attitude. Being positive very important. While someone can be a very driven person, if you think in the negative side, you have to drive yourself harder just to overcome the negativity. This becomes a torture for yourself and people around you. Q17) What’s next in your plans? Have an official launch party for regular customers to thank them for their support. I’ll also let them try the new dishes. I may invite a few media down or have a separate media launch party. Go to more bazaars. Whether corporate offices, or schools. The reason why I started this cafe, and have all this junk, is because kids do not know. Kids just follow whatever the parents are eating. Hope to be able to influence, get the message to the younger generation. Have to do it bit by bit. Long term: Open more outlets around Singapore. I dream of having outlets overseas one day, but have not thought that long ahead yet. It might even be via franchising – we’ll see! Special thanks to Christina for accepting this interview! 😀 Chris is the founder and owner of Dann’s Daily, the only pescetarian cafe in Singapore. To find out more about Dann’s, visit www.DannDaily.com.